Pick your own toppings or order a signature bowl at Sweetfin. 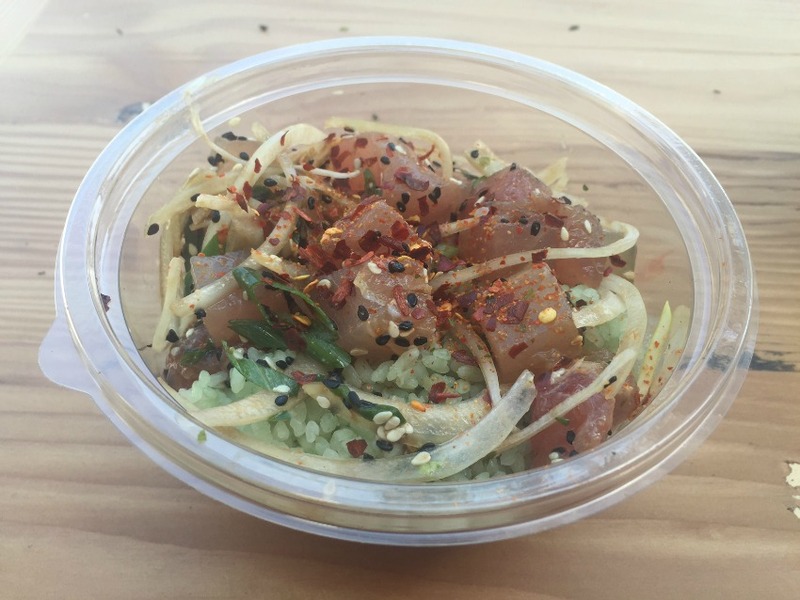 Going to Sweetfin Poké—the new restaurant from Top Chef alum Dakota Weiss that opened in Santa Monica on Monday—for a bowl of raw fish is kind of like going to The Counter for a burger. There are so many toppings you can add that the possible combos are endless, and you might find yourself with option paralysis while standing in line. After you pick your choice of tuna, albacore, salmon, snapper, tofu, or chopped vegetables, select your sauce, and decide whether you want your bowl with bamboo rice, kelp noodle/cucumber slaw, or citrus/kale salad, is when the decisions can really start. Like it spicy? Maybe you should get charred habaneros, chopped serranos, or chile oil? Are you brave enough to order all three? Craving some sweetness? There’s mango or chile-marinated orange. Should crunch come in the form of bean sprouts or crispy garlic, or perhaps wasabi toasted coconut? For those who don’t want to think that hard, there are signature bowls like a classic tuna with a shoyu/sesame oil sauce, white and green onions, sesame seeds, and red chile that’s a nicely balanced version of what most people probably think when they think poké. The other signature options are kale/snapper, spicy yuzu salmon, spicy tuna, mango albacore, sriracha tuna, shiitake chile tofu, and a vegetable poke (those last two are vegan). So, yes, you still might have to make a tough choice. So far, it looks like the neighborhood really wants a restaurant like this. The line was more than 10-deep, and the time it took to get food approached half an hour, when we visited Tuesday afternoon for a late lunch, but the crowd was chill about it. “It smells just like the ocean when you walk in,” one beaming customer said. The friendly staff gracefully apologized for the wait and said hello to customers who had already been in the day before. Everybody seemed happy to be part of this fresh start.